There has been a GP living at this address, or in later years a medical practice here, since at least 1897, which is the earliest date we can currently trace our history back to. There have been many changes in the last 118 years. 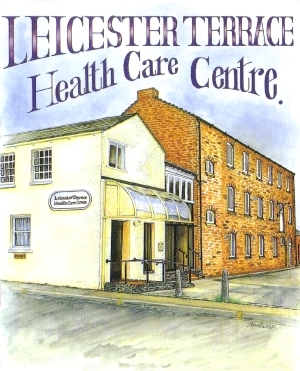 In the early years, only No.8 Leicester Terrace was involved in health care and the GP lived here as his home address, 50 years before the NHS came into being. About 40 years ago No.7 Leicester Terrace was purchased, and 25 years ago the factory/warehouse at the back of 7&8 was purchased. This doubled the size of the surgery. The gardens of 7&8 were built over to make a reception area and waiting rooms which linked the building together. About five years ago the public house next to the surgery, in Adelaide Street, was purchased - no longer to be operated as a pub of course. The pharmacy that was renting space from us in 7&8 moved into the newly restored 'pub' and this allowed us to create new consulting rooms on the ground floor of 7&8. Today we have a modern, spacious medical practice, keeping very up-to-date and working at the cutting edge of general practice, but also proudly retaining our links with our long history. We believe we are the oldest surgery in Northampton to be still operating from its original premises. If you have a story to tell us about our past, or remember coming here as a child a few years ago, we would be delighted to hear your story.